Please contact an authorized dealer for pricing, installation and ordering information. 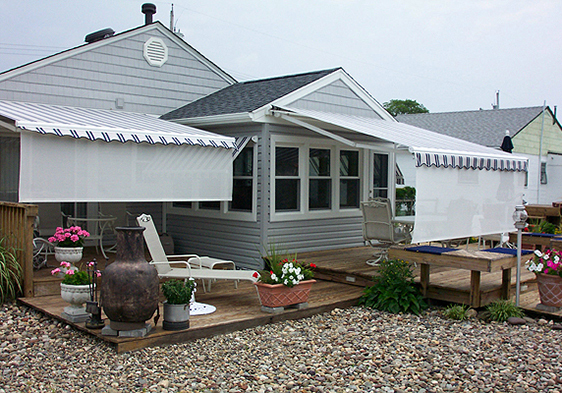 With the exception of window awnings, this popular accessory is available on most of our retractable awnings. A discreet lighting source is securely attached to the inside of the awning front bar, casting a gentle, natural glow onto your deck or patio. It creates a wonderful atmosphere for entertaining in the evenings, giving soft light without attracting insects. Eclipse Lunar Lighting will not overpower you with brightness or attract insects, rather it will complete your outdoor relaxing mood. Your Eclipse shading expert can either order your awning with the Lunar Light System installed at the factory or can retrofit it to your existing awning. Our lighting system is typically ordered with an enhanced remote control – the same one that operates the awning, just on a different channel. The Eclipse Lunar Lighting will allow you to maximize the usage of your Eclipse awning and will convert your daytime shading system into a European evening café. This popular accessory is available on our Eclipse, Eclipse Cross Arm and Total Eclipse models. The Eclipse Drop Shade acts as an extension to your existing awning, dropping down vertically from the front end of your awning to give increased protection again low sun, and also providing additional privacy. It retracts into its own housing, and can be motorized, or operated manually. 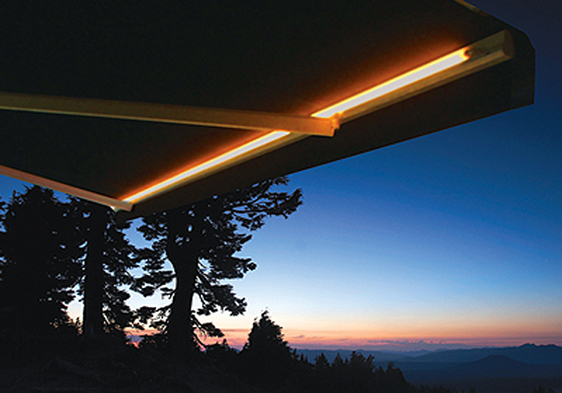 A top selling awning accessory, the Eclipse Drop Shade is your solution for low sun exposure. The Eclipse front Drop Shade is available on Eclipse, Eclipse Cross Arm up to and including 11’6″ projection and all Total Eclipse units – over 16’6″ projection. The Eclipse Drop Shade option allows you to extend a vertical shade from the front bar up to 59 inches (depending on fabric selected). The Eclipse Drop Shade is a practical solution for east or west facing installations or when added privacy is desired. The Eclipse Drop Shade is typically ordered with open weave mesh fabric which allows some light and some air to pass through. This easy to operate option can be driven manually with a hand crank – or with an optional motor, making it another touch of the button solution! Now you can enjoy the pleasure of your outdoor living area on cool days too. The Eclipse Solar Beam Infrared Heater is an effective, safe way to warm up your patio, allowing you to sit outside even after summer has past. With its 1500-watt motor, it’s powerful enough to ensure you stay snug and warm. Fully remote controlled, you can increase or lessen the amount of heat at the touch of a button. Warm up those cool, chilly nights and extend your outdoor living season. The Eclipse powerful, yet very cost efficient outdoor heater will improve any outdoor living area that may need more warmth & comfort. For less than $0.18/per hour, the Eclipse 1500 watt Solar Beam Electric Infrared Heater will allow you and your guests to stay out on your deck or patio longer. This safe, compact, effective and energy efficient heat source allows you to control the amount of heat desired at the touch of a button. Don’t let a change in temperature force your next gathering indoors. 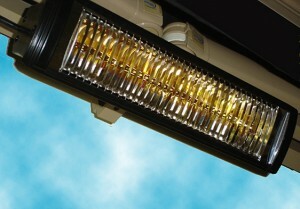 This 1500 watt heater, available in black or white, can mount either to your awning framework or on a wall. The 15’ long heater power cord plugs into an outdoor outlet and has a variable heat controller allowing you to adjust the amount of heat you need. Somfry WireFree sensors work together with your shading system to both increase the efficiency of your awning and protect it when the elements are less than favorable. Wind sensors detect when the wind is too strong, and send a signal to the awning’s motor to automatically retract, thus adding a level of protection against possible damage. Sun sensors will pick up when the sun is too hot or bright on your patio, and will then signal your awning to extend. Combining high performance technology with practical features, your Eclipse shading expert can include wireless wind and/or sun sensors which power your awning or screen to automatically respond to the weather in a dependable and effortless manner, adding a level of protection from possible wind damge. Somfy WireFree Sun Sensor automatically extends your Eclipse awning or solar screen once the sun light reaches a predetermined level set by your installer…and will automatically retract in the same fashion, maximizing the effectiveness of you Eclipse solar shading products. 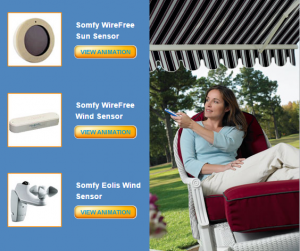 Somfy 3D WireFree Wind Sensor, is a battery powered accelerometer, attaches to the framework of your awning. When the awning experiences excessive wind, the sensor sends a signal to the motor, automatically retracting the unit, providing an added level of protection from possible wind damage. The Somfy Eolis Wind Sensor is ideal for Eclipse exterior mounted solar screens. This product will help to protect your investment from strong damaging winds…automatically.